I'm excited to share that I'm taking part in this month's Progressive Eats dinner. What is Progressive Eats? Well it's a virtual version of a progressive dinner. A different topic is chosen each month and members share theme specific recipes on their sites for you to enjoy. This month we are focusing on figs! Figs seem to be one of those foods that people either love or hate. I happen to be a person that LOVES them. I saw the recipe below on FoodandWine and thought it would be a perfect addition to this month's Progressive Eats dinner. Be sure to check below for all the other delicious fig recipes we are serving. Toast the bread slices until they're crispy on the edges and lightly golden brown. Drizzle the surface of each piece with olive oil and season with salt. 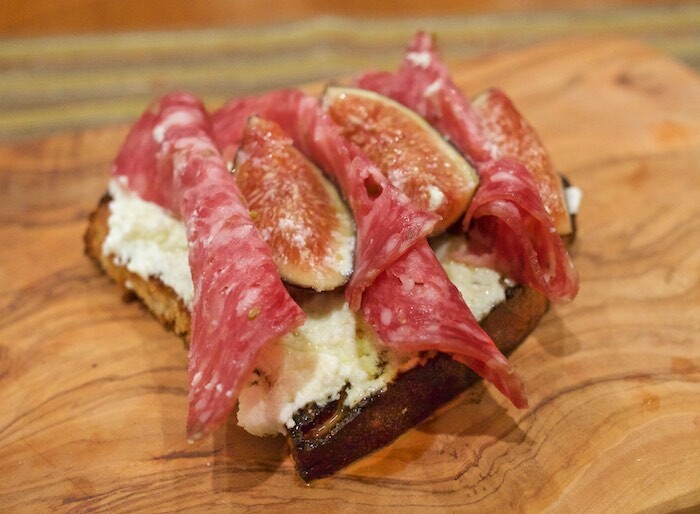 Spread each toasted slice with 2 tablespoons of ricotta, and top with 2 or 3 fig halves. Tuck 3 slices of the salami between the figs on each one. Season sea salt and freshly and cracked black pepper. Drizzle with olive oil just before serving. Such a simple, yet delicious combination!! The salami is a terrific addition. I'm in love with that flavor combination! What a great way to take advantage fresh figs! What a beautiful combination of flavors and textures! My Italian husband would Love these! Great choice!